Each of our two primary charitable endeavors — the Connells Maple Lee Stems Hunger food drive and Bouquets for Books children’s book drive — will expand to two weeks beginning this year. They have been one-week events until now. “Even with the tremendous success of these efforts, we think the potential exists to generate even more community involvement,” said Greg Royer, president and CEO of family-owned Connells Maple Lee. This year, Connells Maple Lee Stems Hunger will run from June 18 through July 2; Bouquets for Books will be Oct. 22 through Nov 5. 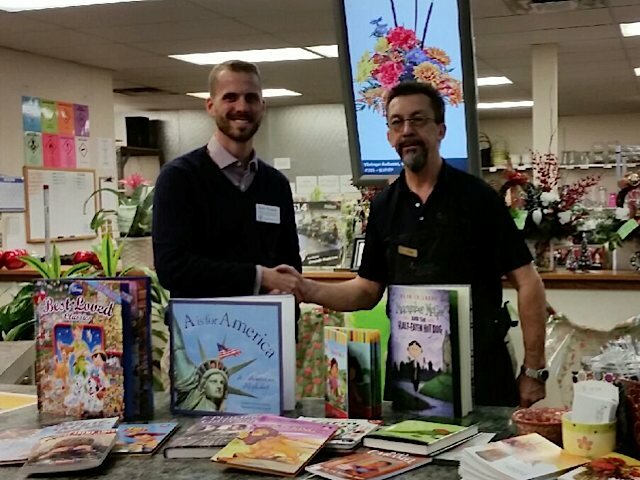 Connells Maple Lee Stems Hunger benefits the Mid-Ohio Foodbank; Bouquets for Books donates books to Bexley Public Library and Delaware County District Library. Our annual food drive collected 240 pounds of nonperishable items for the Mid-Ohio Foodbank. From June 20-27, “Connells Maple Lee Stems Hunger” asked customers to drop off donations at any one of our three Columbus-area stores. In return, donors received a free carnation for each food item, up to a maximum of six carnations per family per visit. Also participating in the food drive was Drayer Physical Therapy Institute, which has outpatient centers in Grove City and Hilliard. Photo: Crystal Wells, our manager in Grove City, with a plate signifying that her store collected the most pounds of food. Connells Maple Lee Stems Hunger, our annual food drive, will return June 20-27 to benefit the Mid-Ohio Foodbank. Customers who donate a non-perishable food item during the event will receive a free carnation, up to six flowers per family per visit. The food drive will be the theme of our June 20 Connells Maple Lee Kids Club event; more details to come on that in the days ahead. Our friends at Drayer Physical Therapy Institute will be helping us again this year, collecting food at the company’s outpatient physical therapy centers in Grove City and Hilliard. Our annual food drive collected 250 pounds of non-perishable items and $45 cash for the Mid-Ohio Foodbank. From June 20-28, “Connells Maple Lee Stems Hunger” asked customers to drop off donations at any of our three Columbus-area stores. In return, customers received a free carnation for each food item, up to a maximum of six carnations per family per visit. Also participating in the food drive were Drayer Physical Therapy Institute, which has outpatient centers in Grove City and Hilliard, and Columbus-based Battelle. We recognized Grove City for collecting the most pounds among our stores. Photo, Crystal Wells, Grove City store manager, and Andrew Royer, Connells Maple Lee regional manager. Thank you to everyone who helped to make this year’s food drive a success! Mid-Ohio Foodbank’s on-site garden produces thousands of pounds of food each year. Connells Maple Lee’s annual food drive – Connells Maple Lee Stems Hunger – will return June 20-28 to collect non-perishable food items for the Mid-Ohio Foodbank. We’re asking the public to bring nonperishable food donations to any Connells Maple Lee store. For each food item, donors will receive a free carnation, up to a maximum of six carnations per family per visit. Our stores are at 2408 E. Main St. (Route 40), Bexley; 2033 Stringtown Road, Grove City; and 8573 Owenfield Drive, Powell. Connells Maple Lee’s annual food drive – Connells Maple Lee Stems Hunger – will take place June 20-28. The Connells Maple Lee Kids Club will help out with a special event on June 21 for children ages 5 to 12. They are asked to donate a non-perishable food item as the price of admission and to bring an empty food can that they can fill with flowers to take home. Participants also will receive a free balloon and have an opportunity to enter the kids club’s birthday card design contest for a chance to win a flower delivery. Time slots are available at 10 a.m., 2 p.m. and 3 p.m. Registration is required by calling your nearest Connells Maple Lee store: 2408 E. Main St., Bexley, 614-237-8653; 2033 Stringtown Road, Grove City, 614-539-4000; and 8573 Owenfield Drive, Powell, 740-548-4082. Connells Maple Lee Stems Hunger benefits the Mid-Ohio Foodbank. Our second annual Connells Maple Lee Stems Hunger event collected 114 pounds of non-perishable food and $24 in cash donations for the Mid-Ohio Foodbank. The number of pounds represented a 37 percent increase from the event’s first year. From June 21-29, we asked customers to bring food items to any of our stores. For each food item, they received a free carnation, up to a maximum of six carnations per family per visit. We are grateful for the generosity of customers such as you. Participants in the Connells Maple Lee Kids Club event on June 22 demonstrated a “can”-do spirit in the fight against hunger. Thanks to the children and parents who came out in support of our annual food drive, Connells Maple Lee Stems Hunger. We asked participants to donate a canned good or other non-perishable food item as the price of admission in conjunction with the food drive, which benefits the Mid-Ohio Foodbank. The Connells Maple Lee Kids Club event on June 22 will help kick off the annual Connells Maple Lee Stems Hunger food drive. Children ages 5 to 12 are asked to donate a non-perishable food item as the price of admission and to bring an empty food can to fill with flowers. Participants also will have an opportunity to enter the kids club’s birthday card design contest for a chance to win a flower delivery. Registration is required by calling your nearest Connells Maple Lee store: 2408 E. Main St., Bexley, 614-237-8653; 2033 Stringtown Road, Grove City, 614-539-4000; and 8573 Owenfield Drive, Powell, 740-548-4082. Connells Maple Lee Stems Hunger is June 21-29. The collected food will be donated to the Mid-Ohio Foodbank. Connells Maple Lee Stems Hunger will return June 21-29 to collect non-perishable food items for the Mid-Ohio Foodbank. Customers are asked to bring food items to any Connells Maple Lee Flowers & Gifts store and place them in a collection box. For each food item, they will receive a free carnation, up to a maximum of six carnations per family per visit. In its first year in 2012, Connells Maple Lee Stems Hunger collected 83 pounds of food for the food bank.